Are you looking for appealing but easy lunch options for your child? Here is how I put together a quick bento lunch. I’ve been making bento lunches for my daughter since she started kindergarten. I began making them because I wanted to ensure she was actually eating a lunch I could feel good about. She was so taken by the cuteness of it all, that she didn’t think about what she was eating. I packed things she’d normally snub her nose at, but—because it was presented in a cute way—she ate it. I have created some adorable lunches based on her likes, holidays, and other special events. Some were so fun that her older brother even asked me to make one for him. Now that she’s older, she doesn’t want lunches in the shape of characters; however, she still wants them to be somewhat cute. In the early days, I would plan meals ahead of time, thinking of how I would create a theme or character. Nowadays, I am just too busy to put that much time into each lunch. In fact, my daughter now helps me pack her lunch most days by choosing the various lunch boxes and bento supplies we have on hand. Every so often, I get behind on grocery shopping, and we scramble to make a decent lunch. It’s times like these that I am particularly thankful for Horizon® milks and crackers. The milks are shelf stable and don’t need refrigeration. I keep a box or two of crackers and a package of milks deep in our pantry for times when we need a quick lunch or snack. You’ve probably seen some amazing bento lunches that almost look too fancy to eat. I’m going to show you how to put together a cute, finger-food lunch that your child will enjoy eating. The best part? It takes only a few minutes to create. Pick out your lunchbox. I have this classic style lunchbox featuring the upcoming Peanuts Movie. Pick out containers to fit in the box. I love using silicone cupcake holders. They hold a variety of items and wash up nicely. With these larger cups and the Horizon® Kids Aseptic Chocolate Milk, I had room for a plastic container. Put a Horizon milk in the lunchbox. I sliced cheese into small strips and placed them in one of the cups. I then filled the rest of the cup with the Horizon® Cheese Sandwich Crackers. Place a bunch of Horizon® Peanut Butter Sandwich Crackers crackers in the other cup. Wash and cut the fruit and veggie, and place in box. I added a little container with some ranch dip for the carrots. Since I was using a Peanuts lunchbox, I added a package of Snoopy fruit snacks as a treat. How easy is that? All finger foods means no utensils are needed. My daughter couldn’t wait to eat her lunch. The chocolate milk and peanut butter crackers were the first to disappear. My daughter loves Horizon® milk boxes because they taste good and they have a fun, retractable straw. I love that they don’t need refrigeration, have 8 grams of protein and contain no high fructose corn syrup. They are a great substitute for juice boxes! Horizon® sandwich crackers have real organic cheese and peanut butter—excellent for lunch and beyond! I picked up the Horizon® products at Walmart. I found the milk in the juice/drink aisle and the cracker sandwiches in the cracker aisle. Just look for the red and yellow packaging. Right now, the Horizon® cracker packaging features The Peanuts Movie which hits theaters on November 6th. We love Snoopy and The Peanuts, so we can’t wait to see the movie. Check out the movie trailer here. That pages also includes other easy lunch ideas. I’ve shared how easy it is to make a bento lunch for your child. 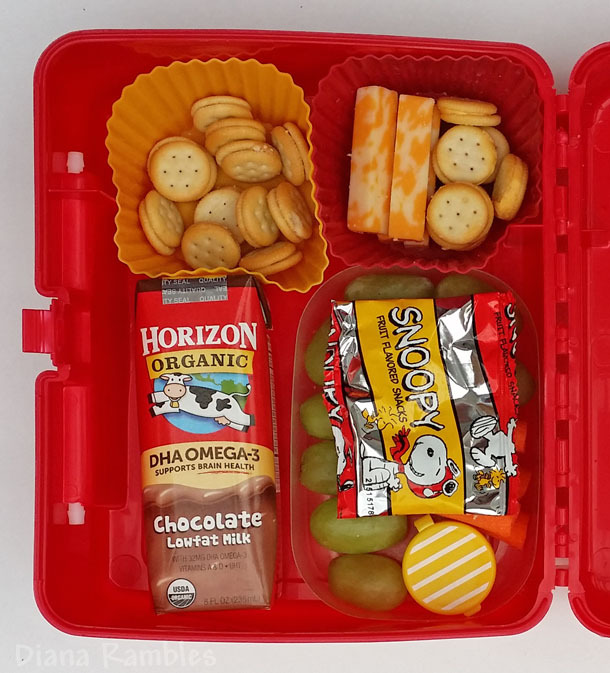 Visit the Horizon® site and play Pack-N-Snack to see how many lunches you can pack in 60 seconds. I packed eight! What about you?